If for whatever reason it is not possible to connect to the HVAC system, this system can also be used to easily and effectively vent from the equipment room or closet to another area. The system works in conjunction with the Return Vent System Rough-In Box (VS-RVS-BOX) and from that box, you would typically use 4" flex pipe and let the HVAC contractor make the connection to the HVAC system. If just venting to another area, in that area you would use either the 4x4 duct box or the 4x8 duct box (VS-WDB-HFL or HF) and also the 4" to 3" reducer (for converting the different size flex duct needed), and connect the two duct boxes. In this scenario you would want to vent from the room or closet to a main room or hallway in the house and close a return vent if possible so the warmer air is still reprocessed most efficiently. 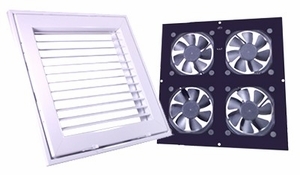 If you use the 4x4 duct box, you can use the passive grills for 4x5 openings (GR-45) and if you use the 4x8 duct box, use the GR-410 or you can use a standard 4x8 HVAC grill if you wish to match the other grills in your home.